In an incredible animal challenge to human authority, a sheep uncharacteristically went rogue and revolted against its shepherd in a vicious attack that was caught by the dashcam of a nearby motorist. The shepherd was rammed no fewer than three times by the aggressive animal who took the opportunity to pounce when the rest of the flock was startled by a passing car. 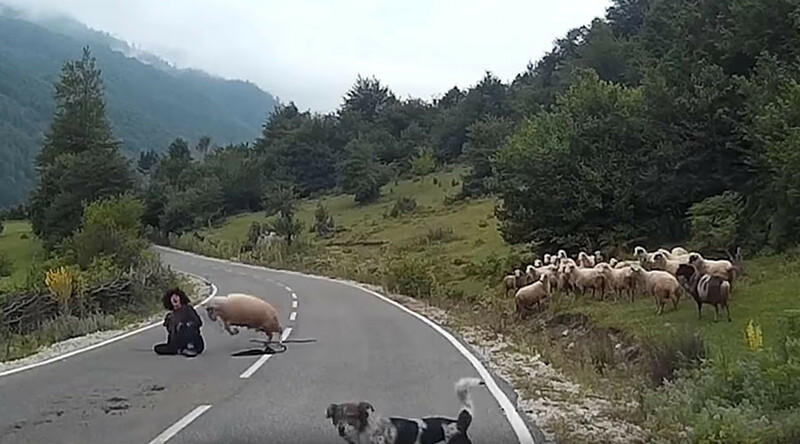 In the footage, the shepherd can be seen calmly herding the flock along a picturesque mountain road when a passing car sends the animals into complete disarray. The sheep ceased his relentless attack only when the German-speaking driver of the car proceeded to honk their horn and yell at the animal – while the shepherd can be heard yelling in agony. While the dashcam date shows the footage as being filmed in 2014, it recently went viral after being shared via LiveLeak, generating more than 125,000 views in less than a day of being posted.